This month's newsletter will introduce you to a strong female hiker's voice for the outdoors, as well as a new magazine called Wild Women (I like the sound of that, don't you?). And if you're not sure how you feel about brown (grizzly) bears, you can watch live streaming video of them feeding in Brooks Falls, Alaska. Lots more breaking news in the hiking world in the July newsletter, too. Let's get right to all of the fun! Teresa Baker is an activist hiker, a veteran of 8 brothers who shared outdoor time with her every day during childhood, including hiking. This interview gives you a glimpse into Teresa's motivations for hiking, and for sharing her love of outdoors with other females. Her thoughts on solo hiking echo what I see in the emails I receive: Women are craving "alone time" on the trail, but are hesitant. That hesitancy motivated her to put together what she called the Hike Like A Girl event in May 2016: She worked with partner organizations to encourage women to get out on a trail (or at least into the outdoors), and then share it on social media to encourage other women. I admire Teresa's "yes it can be done" attitude toward taking those first few steps into the world of hiking, regardless of where you live or what your previous exposure to the outdoors may be. She's been recognized for her creative pioneering work as one of Patagonia’s Women Active Activists. Just thought you'd like to "meet" a woman who's getting more of us onto the trail by using social media's long reach. I'd sure love to hike with her! That stands for perfluorocarbons, which are powerful chemicals used in making hiking gear as water repellent as possible. My gear locker is off gassing PFCs as you're reading this. I'm guessing your footwear, jackets, tents and other gear is, too. So it was a big deal to me when Columbia (huge U.S. gear maker) announced a PFC-free jacket, coming onto the market in early 2017. To be fair, a Swedish company already figured out how to ditch PFCs: Fjallraven. But then Sweden always seems to be ahead of the pack when it comes to high quality outdoor gear, probably because of their extreme outdoor conditions and their commitment to the environment. I will definitely be taking a hard look at this opportunity to reduce PFCs on my body (and in the environment). Read all of the details about Columbia's bold-for-the-U.S. move to eliminate PFCs from jackets here. I have done my best to ignore the adult coloring book craze in the United States, because I'm a "color outside the lines" kinda woman now that I've retired from academia. But I couldn't ignore a National Parks coloring book when I stumbled upon it. These folks did something wonderful: They converted their classic posters of the 59 national parks into coloring pages that would look great in a frame above your desk. They threw in some nature quotes and a few bonus pages, too. The high quality paper is made for coloring with crayons, pencils or markers, so kids can have some fun right alongside you. Quite a nice departure from the glut of adult coloring books, I think you'll agree when you see these posters. When I saw this live video feed from Brooks Falls, I knew I had to share it with you. Brown (as in grizzly) bears are my one big fear when hiking. In fact, I am in hyper alert mode for the entire time I remain in grizzly country. So I decided to use this glimpse into the lives of brown bears to desensitize myself a little bit. And it worked! While I am still "bear aware" to the nth degree, I have a new appreciation for the daily challenges these magnificent predators face. Bonus: The bears are in spectacular Katmai National Park, a place I would never sleep a wink in!! But a virtual visit every so often is a lot of fun. I Want To Sock It To You! Armaskin has generously donated two pairs of their newest anti-blister socks for a Hiking For Her give-away. These socks are designed for trail shoes, rather than the longer version for boots that I reviewed. 1. Visit the Hiking For Her Facebook page and make a comment about one of the daily posts between July 25 and August 5, 2016. On August 6th, check back to see if you're a winner & then send me your mailing address and foot size. 2. 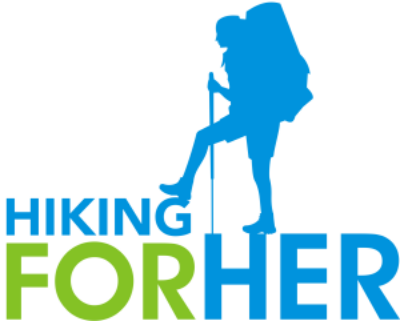 Post your favorite, or most recent, hike by August 5, 2016 on this Hiking For Her Share Your Hike page. All names will be entered into a random drawing to take place on August 6, 2016. Regardless of which method you use to enter the socks drawing, Armaskin will ship them directly to you, which is why your mailing address is needed. These socks are really different, and really effective at preventing friction and heat build up on your feet. Don't miss your chance to test them out, especially if you're prone to blisters. In a perfect world, there would be lots of magazines for women hikers. The photos would feature women of all ages, all sizes, all skin tones, all abilities, all backgrounds --- and all of them enjoying their trail time and other outdoor pursuits. Here's a magazine that brings us one step closer to the perfect world: Wild Women Magazine. Use this link to get your free issue. And don't forget to check out their woman-only expeditions! They are entirely drool-worthy. It's important to me to help every woman get out onto a hiking trail in comfort and safety. That's why I created the Hike With Me "find a trail buddy" program. If you haven't heard that news before, you can read about it here. This month there are a few women who haven't found a trail buddy yet, so I'd like to mention where they are located in case you're hiking in that area and want a trail companion. Hiker #1 is looking for a dayhiking partner of any ability level in New Mexico, in the 50 - 60 year age range. Hiker #2 is looking for a dayhike trail buddy, any ability level, in the 30-40 year age range, in Massachusetts, Southern NH, southern Vermont, or southern Maine. Use the Hike With Me link above to enroll, so you can get your boots dusty! I'm so glad you're in the group of human beings who equate hiking with happiness. It's such a joy to open up my email and hear from you, so don't be shy about sending your thoughts, photos, and questions my way. I read, and respond, to every email I receive. Which means if you don't get a reply, something went wrong with the email delivery. So try again, using a different email address, or contact me through the Hiking For Her Facebook page. Your messages are so important to me that I don't want to miss any! This month, savor your trail time, and take a moment to enter the drawing for a pair of Armaskin hiking socks! Did you receive this newsletter from a friend? Sign up for your own free monthly subscription.